The City of Berlin straddles the Fox River for several miles. Founded in 1847 by Nathan Strong, its natural resources and location on the river contributed to its rapid growth. Strong and his colleagues were part of the Fourierite movement located in Ceresco (later the City of Ripon). Disenchanted with the movement Strong decided to strike out on his own and establish a new settlement. By 1850 there were 250 residents, most coming from the New England states. At that time only land on the east side of the river was available, the west side was still “Indian Country.” The Indians ceded their claim in late 1850 and it was opened for settlement. The railroad came in 1857 opening another avenue for travel for the residents. In that same year the city was incorporated. Berlin grew rapidly because of its location and of the goods and services its businesses could provide. When Green Lake County was formed, it served as the county seat for a time. Wisconsin’s commercial cranberry industry was started in the Berlin area. Her stone quarries provided jobs and state-wide reputation and brought immigrants from Scotland, Wales, Poland, and Italy to work in those quarries. From the mid-1860’s to the 1990’s Berlin was known as “the fur and leather city” because of the multiple businesses located here. The first milk condensery factory in the mid-west was started in the early part of the 20th century by the Carnation Co.
Today Berlin is home to several well-known manufacturers such as Magnum Power Products, producers of self-contained light towers and generators; Wisconsin Spice, servicing the food industry; and RAJ who creates and supplies many of the professional and college ball team uniforms, to name a few. 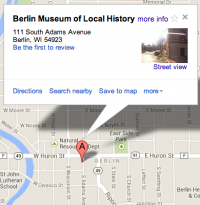 There have been several chapters of Historical Societies located in Berlin over the years but they disbanded for one reason or another. In March of 1962, twenty-two people gathered at the Whiting Hotel to organize this chapter of the Berlin Historical Society. The members voted to charter with the Wisconsin Historical Society that same night. In 1963 the Berlin club was given the opportunity to acquire a one-room schoolhouse located in Waushara County. Built around 1866, the school was in continuous use until 1960. Members received permission from the City of Berlin to locate the school in Riverside Park. Former students of the school and other interested citizens helped furnish and maintain the tiny museum. Later the club was able to use the third floor of City Hall to set up more history displays with items from their collection. In 1984 they received title to the property at 111 S. Adams Ave. Companies, groups, individuals and the City came forward with donations and labor to help transform the house and carriage house/garage into a museum. In 2001, a former Mayor donated the blacksmith shop to the club, expanding our campus even more. In 2011 the club contracted with a metal sculptor to produce the First Nations monument located in front of the Bottling Works building. In 2012 the club celebrated their 50th anniversary.